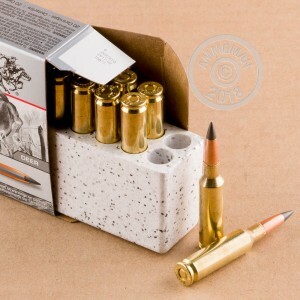 When Hornady introduced the 6.5mm Creedmoor in 2007, many other manufacturers stepped up to the plate to take advantage of the new caliber's long-range capabilities in hunting and precision competition. 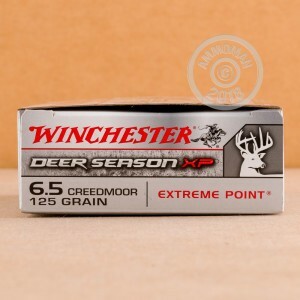 One such organization was Winchester, a timeless American powerhouse with over 150 years of manufacturing experience. 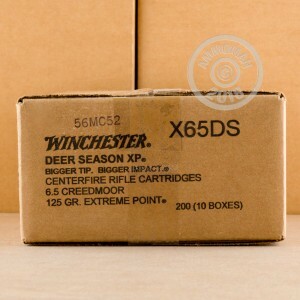 Their hard work was poured into these Deer Season XP cartridges which feature the Extreme Point (XP) projectile crimped into a reloadable brass casing that also houses a non-corrosive Boxer primer and a measured load of purpose-made powder. This XP round weighs in at 125 grains, a perfect fit between Hornady's original tolerances, and consists of a copper-jacketed lead bullet with an enlarged ballistic cone up top. The large-diameter windshield is intended to create a massive entry wound as the bullet enters a target so that rapid bleeding keeps big bucks from running away. As the bullet travels in a target, its controlled expansion will cause slight tumbling and direct energy towards vital areas like the heart and lungs, stopping a game animal with impressive energy and humane efficiency. The ribbed cannelure which helps control this expansion also keeps the 6.5mm Creedmoor projectile firmly clamped in place, preventing setback-related malfunctions and ensuring repeatable accuracy with every shot.